Diablo/Murloc WoW Pet for Blizzcon 2011? MMO Champion has been posting screenshots and now an animation showing off a new WoW Virtual Pet that’s not yet enabled, but is in the game code on the test realms. 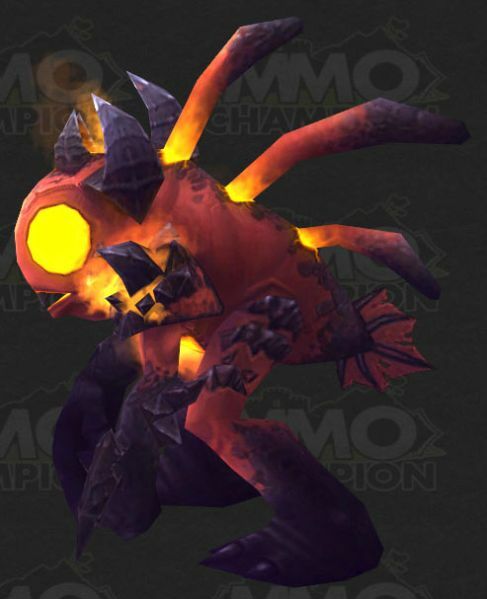 It’s a Murloc styled like Diablo, and while it’s not clear where or how this creature will become enabled in the actual game, most players are speculating that it will be 1) the WoW pet given away in this year’s Blizzcon goodie bag, or 2) a special WoW virtual pet reward for purchasing the Diablo III Collector’s Edition. Apparently it’s named the Murkablo, and it has a cute fire-breathing animation, which is shown off in the video below. WoW has featured other Diablo-themed pets, including Tyrael and Diablo, and since they’ve gone with Murloc-themed virtual pets as prizes in the last few years of Blizzcon goodie bags, that’s where my bet for this guy points. Click the thumb to see it from more angles, or view the movie below. Rarrrr! Update #1: As pointed out in the comments… since when does Diablo breath fire? Where’s the lightning hose? Update #2: Also from comments, Murkablo is using Deathy’s animation as a place-holder for now, hence the fire-breathing and flight. Presumably the final version will have more Diablo-appropriate animations. E3 Info and Media Overload!